The ultralight packable daypack search! A slew of technological advancements in the outdoor industry has arrived in recent years, and ultralight travel daypacks have enjoyed the trend that has thankfully depleted the gear requirements of decades past. Packs are now half the weight they were a few years ago, and just as functional. An ultralight packable backpack, ready to go. One of the coolest developments for the ultralight backpacker, whether a hiker or traveler, is the ultralight packable daypack, which folds up into its own pocket, weighs just a few ounces, and is one of the best travel accessories you can find. I used to spurn the extra pack, and on day trips I’d just stuff the essentials into cargo pockets, if I took anything at all. But now that ultralight travel daypacks can be found for just a few ounces, I bring one along on every trip, and I use it all the time. So if you’re tired of carrying the “extra pack” on your front while you’ve got the “real pack” on your back, then these are for you! Although I highly recommend them to anyone traveling or hiking or doing anything else that requires a simple pack, you won’t want to use them in every situation. They’re great for daytrips while the rest of your gear sits in a base camp or a hostel. Just keep in mind they’re super thin, and the straps have minimal padding, meaning you should only carry lighter loads, and hopefully nothing fragile, unless you wrap it in a sweater or something. They’re perfect for bringing a jacket, food, water, minor medical equipment, and maybe a book or two, in which case they’ll do quite nicely. And try not to drag them along scratchy concrete. 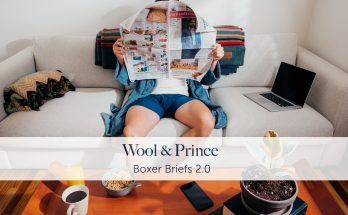 Some of the more full-featured items on this list, however, are a lot heavier-duty than the wispy, ultralight alternatives, so this category is only getting more impressive all the time. So without further ado, here are my top picks. If you’re obsessed with ultralight travel gear, you will love this pack. 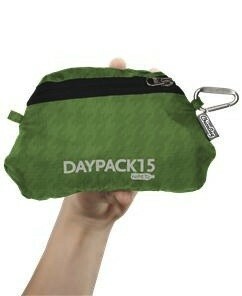 It’s easily the smallest and lightest pack I’ve ever seen, so if cutting weight is your thing, the search is over. This pack will literally fit into a teacup. The downside: Just one main compartment, and that’s about it. While it has an interior compartment (the pocket it packs itself into), it’s so small you won’t be able to store much more than some cash and keys in there. You’ll be sacrificing organization to cut weight. If that’s your thing, perfect. But if you want at least a little bit of organization, this one isn’t designed for that. Oh, and I found the straps tended to loosen themselves, so I had to tie a knot to keep them in place. The fabric is also quite crinkly, but that tends to be the case with fabrics this thin and light, so don’t expect to keep hostelmates sleeping while you pack and unpack this thing. It’s really going for the ultralight crown, which some people obsessively need, and although it’s compromising on other features to get there, they didn’t compromise at all on weight or packability. This newcomer from Osprey looks quite a bit like the Sea to Summit shown above, but without even going one ounce heavier, they’ve added a side pocket, and a more usable zippered stuff pocket. If you want the additional organization, it’s a great balance, while still retaining the ultralight specs. Osprey is actually getting into the ultralight travel gear game, so they’ve expanded into packing cubes, toiletry kits, and other items of interest to travelers, rather than just mountaineers, and I’m happy to see them doing it. This one is a great example. I will mention that although the side pocket can handle a water bottle, it’s not a great idea to put big ones in there, as the weight can become easily lopsided without a corresponding pocket on the opposite side to rebalance everything. Big water bottles will have to fit inside, and the outer pocket can handle sunglasses, an umbrella, or something like that. Buy it from Matador, or Huckberry. This pack offers a number of unique features you don’t often see in a packable backpack…most notably: waterproof fabric. And the zippers are all water-resistant as well, meaning it’s the most weather-protective packable daypack I’ve yet seen. Another feature I like quite a bit is how the small exterior zippered pocket goes all the way down to the base of the pack, meaning it’s big enough to hold an entire water bottle. This is a lot more useful for larger, insulated, or reusable bottles, which tend to fall out of tiny side pockets way too easily. It also ensures the weight is carried in the middle, which is a lot more ergonomic. If you plan on using a reusable water bottle, this is definitely a great option, as you won’t have to shove it into the main compartment along with everything else. I was sent a sample of this to try out, and it quickly become a favorite for these reasons. I will mention the crinkly fabric, which is inevitable with packs of this weight, and the shoulder straps are a bit far apart, so it’ll fit larger people a little better than smaller people. The mesh side pockets, by the way, are made with something super tough. They feel almost like a wire mesh, rather than a dainty fabric that might fall apart easily. Durability all over the pack feels quite solid to me. They’ve also got a bigger, heavier, more full-featured one called the Beast, but I figured one entry per company was plenty here. Eagle Creek seems to update this design every few years, so I try to keep track of what they offer at any given time, as they’ve always got something pretty reliable. This one has a much-appreciated feature that paranoid travelers will enjoy: locking zippers, and the additional “lazy-lock” option for more casual protection. The zipper pulls can stow in the metal ring along the top, making the bag much more difficult to open, so thieves in a crowd won’t be able to get in and run away as conveniently as they would like. You might notice how it has the smallest capacity on this list, so this is just for the minimalists who need just a water bottle, a jacket, maybe a map, and a book. You can certainly get by with just its 13 liter size, but some of the bigger ones are better for more intensive use. It just depends what you’re doing, but for the most part, day hikes, whether in a city or through the mountains, can be done at this capacity…unless you’re carrying more than one jacket at the same time, and need to store both in the pack if the sun comes out. This began as an upgraded version of ChicoBag’s original daypack, but this one eventually replaced the original, offering more features and more flexibility than the first. With those steeply-angled side pockets, this pack will carry water bottles and other taller items quite easily, which is why I wish all side pockets would borrow this idea. The hydration reservoir on the inside doubles as a laptop sleeve if necessary, and the sternum strap is helpful for smaller users, whose shoulders aren’t always wide enough for some of the other designs. Tiny people definitely need sternum straps, so keep an eye out for those options. 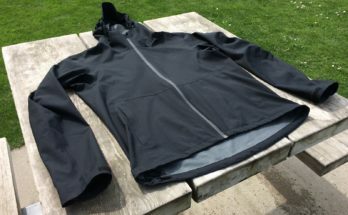 The fabric isn’t super weather-resistant, so this would be a good one if you don’t mind bringing an umbrella, but it’s otherwise a great all-around balance between features and packability, offering more pockets than some of the smaller, lighter designs, both inside and out. Finally a top loader, for all those hiking junkies who just love that stuffable, open-topped design. This one is quite spacious, too. We’re definitely getting into the heavier range of the list with this entry, although at 9 ounces it’s certainly not “heavy.” The packed size is definitely going to be larger than the previous entries on this list, but if you need that extra capacity, and you want the flexibility of a top-loading design (which is easier to stuff to the max), then the extra weight will certainly come in handy. I might go with something lighter if I’m just using it as a simple daypack for wandering around town, but if you plan on serious use all the time, especially with a larger load of gear, the extra capacity is what you would need. I originally didn’t include this one in the list, as it does a couple things that bother me; but if you’re able to get around them, it’s a tough, durable design that’ll handle years of adventures. I have two problems with the design; first, the non-stretch mesh side pockets can fit a water bottle, but not if the pack is stuffed full. Secondly, I don’t like the “bridge” shoulder strap design, which limits how high you can carry it on your back. If you don’t mind those issues, then it’ll work just fine, and it’s made of a very tough material that doesn’t feel flimsy at all, and it’s plenty popular with the people who use it. It’s not light, and doesn’t pack down all that small (it folds into the top pocket, in the lid), but it’s heavier-duty than many others, making it better for outdoor use. Which makes sense, given the people behind it. Shorter people will probably get annoyed with the “bridge” shoulder strap, however, since it requires carrying it lower on your back, so I would say this is better if you’re of average (male) height or above. It’s a tall and skinny design, which is good for breathability and weight distribution, making it even more appropriate for hikes and other outdoor use. They’ve still got it on Amazon. This is another full-featured option, with more organizational areas, both inside and out, than many other daypacks out there. I received this as a test model to try out, and it’s a good one for those who prefer better organizational options, rather than having to dig through a single giant compartment. Unfortunately, this pack has been discontinued, and although Tortuga has since released a similar design (currently known as the Setout Packable Daypack), I just like this one a lot. It’s still showing up on Amazon for now, so I’m keeping it here on this list until its last breath. The organizer panel on the inside allows for greater organization than most others, and along with the laptop compartment, which is a rare feature in most items like these, it’s easier to keep everything in its place with this design than many others, especially with so many exterior pockets. This one’s heavier than the others, but it has great organizational options, with several built-in pockets and carabiner clip rings, and it’s tougher than the rest. I got a test sample of this pack, and really enjoy the “ladder” pockets on the inside, which allow you to stack contents vertically, so they don’t all collapse to the bottom. The internal dividers in the main compartment can also be used to form a back cushion, by stuffing rain jackets or fleece jackets in them. The vertical layout distributes the weight nicely as well, keeping the weight close to your back. My only problems were the non-cushioned shoulder straps, at a fairly horizontal angle. People with sloping shoulders will feel a pressure point where the strap digs into the neck, which isn’t so comfortable, especially after a long day and a heavy load. If you’re wearing a sweater, it’ll help out quite a bit, but summer use might create that issue. Also, I’d go with one of their Halcyon fabric options rather than Cordura, since the friction of the Cordura fabric, especially on the back panel, can scratch up t-shirt fabrics pretty quickly. Though it’s not often mentioned in travel gear communities, Eddie Bauer has some really high-quality gear, and a wonderful warranty. Their Stowaway packs have also been a favorite of many travelers for quite some time, and come in many colors, and multiple sizes. It’s also easier to find them on sale than most others, making them quite a bargain. Eddie Bauer makes a 20 liter version as well, though it doesn’t have the same pocket layout. I decided to include this one here, because I like the overall layout better (the 20 liter version has one of those “vertical” zippers that’s silly and pointless), and I also wanted a 30 liter pack somewhere on this list. It’s huge, and with the expanding side mesh and giant front mesh stuff pocket, you’ll be able to carry just about anything. It also has a cushioned back panel, which is more useful if you’re planning on hauling things around all day, making it a better choice if you’re expecting intensive use. It’s completely unstructured, so if you’re loading it up all the way, it’ll help to have some organizer cubes, especially since you don’t have side compression straps to bring the weight closer to your back. The extra space can easily mean any gear will collapse to the bottom of the pack, so you’d need some internal organizers to get the load more vertical. Buy it from LL Bean. At the moment I’m writing this, this is just one of two packable daypacks I’m aware of with a sternum strap and a waist belt (the other being Matador’s Beast pack). If you want full-featured performance, this is definitely one of the very few choices that’ll handle everything. With a fully cushioned back panel as well, it’s definitely going to be more comfortable over long periods and under heavy loads than much of the competition. It’s heavier, but the more you’re hauling around heavy gear in this pack, the more you’ll appreciate those extra features. The side compression straps are also useful in preventing the load from sagging, which is a problem with unstructured packs like these. Tightening things up brings the weight closer to your back, and allows vertical stacking a lot more easily than a big open pocket with no adjustability. Multiple side mesh pockets and that giant stuff pocket in front mean you can carry quite a bit of gear, and it has that top zip pocket (plus another one that’s hard to see, along the side of the front stuff pocket). If you’re planning on serious hikes with a full day’s worth of gear, but still want something packable, I think this is it. It has everything, and nothing else does. As mentioned above, this list was updated in 2017, and I think this represents the best of the choices available at the moment. A few other, smaller companies have gotten in on the action, and some of them look quite similar to the options here (the Sea to Summit one, for example, has a million knockoffs). 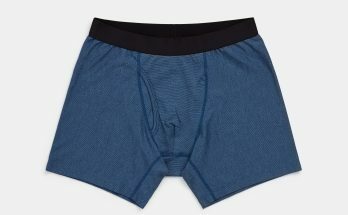 But each of the options listed here comes from a reputable company, and many of them are available through retailers that stand behind their products 100%, which is why I’ve included them here. Some of the no-name brands popping up for dirt-cheap prices don’t quite fill me with confidence, and lifetime warranties, available from brands like Osprey, REI, LL Bean, and Eddie Bauer are what I’d prefer any day. Previous Article Do I really want to be a travel blogger? Sea to Summit makes a waterproof one (not the one on this page), but I wouldn’t recommend carrying books in bags like these. Most of these are incredibly thin, and the corners of the books will jab into the fabric. If you have to carry books all day, you’re probably better off finding a “real” backpack. The ones on this list are just for quick trips around town without much gear. For “real” backpacks, I like Tom Bihn and Ivar, and North Face makes plenty of options. Waterproof backpacks are incredibly difficult to find; I’ve listed a few here, and Mission Workshop makes some, but it’s not going to be easy finding one. Is the Tom Bihn one actually packable into itself? It’s not supposed to stuff into itself, but it can flatten down well enough. It’s one of the larger ones, though. More structured and durable than the tiny, packable ones. It easily fit inside the diabolical “personal item” limits imposed by Spirit and did what I needed both as a primary pack and as a feather weight day bag. Though I did cheat a little by packing my iPad mini, other gadgets and chargers, travel documents, money, etc in my scottevest. The pack was a little too small for primary luggage though. After buying a few souvenirs (mostly coffee and spices) my jacket was bulging suspiciously on the way back. The good side of having such a tiny pack: It was much easier to talk myself out of buying unnecessary stuff along the way. Since then I’ve used it as a day pack around town, weekend road trips, sci-fi conventions, up in the mountains, for my son at Cub Scout camp… These little backpacks are pretty useful even if you never travel very far. The seams are starting to pull a little; I can see daylight through pinholes around the seams. But it’s been that way for months so I think it still has life left. If I had to do it over again I’d probably look for something a little fancier. Preferably with water bottle pockets, which this one lacks. But not bad for something cheap to test the concept. I like that one. It looks like a weird alien invention or something. I need something more serious as a regular pack, as the lack of structure and cushioning is a problem for my tiny frame, but for shorter activities during the day, these are great. Although I would say that with a laptop, it wouldn’t be a bad idea to bring a “real” backpack. My Wildcraft summit pack has been going strong after almost daily use in the mountains. On most days, I usually carry a 750ml water bottle/flask, a rain jacket, rain pants(yep, crazy monsoons), a midweight fleece hoodie(still can’t afford down. Did get my hands on my first piece of merino though), a pair of woollen socks in which I stuff my kindle and phone, wallet, lip balm, pain balm, keys etc and my 15 inch macbook pro. On days that I need to, I can easily add an extra set of clothes and/or a bag of veggies and fruit when I go shopping. There is no padding on the back and the macbook can be sharp against the shoulder blades. I am currently wrapping the laptop in a shawl and that works okay but a cushioned sleeve would work better. By far the best feature of the bag is that water bottle goes into a centre pocket and not at the side and that makes a world of a difference to the balance and comfort. I used a Quechua daypack which was similiar to the ebags posted above before this but can’t see myself finding a better daypack than this one. Centrally-placed water bottles are wonderful for these ultralight packs. I had gotten into the habit of putting water bottles into the main compartment and just taking big sips every so often instead of small sips more frequently, but having its own pocket is extremely useful. Looks like these are only available in India, but people should take a look for this one if they go visit there. In all seriousness, check out the Civita Day Pack from Rick Steves (https://store.ricksteves.com/shop/p/civita-day-pack). Been using one as a packable daypack for over 10 years now with no complaints. Empty it just lays flat and is the last thing packed and first thing unpacked. My son stole mine when he went to college and I had to buy another. My wife swears by the hemp version (https://store.ricksteves.com/shop/p/hemp-day-pack). At the risk of being laughed out of the comments section, I thought I’d recommend my own go-to packable daypack – the Eddie Bauer Rippac Traveler. I know Eddie Bauer screams “socks-and-sandals sightseer on a bus tour” much more than it does “serious traveler,” but hear me out. I came across it on a layover at St. Louis airport in the Eddie Bauer store (flight was delayed…I was bored). I had been looking at Chico Bags, etc. online, but went for this one as soon as I stumbled across it in person. Both on the shelf and in-use, it looks like a “normal” daypack despite it being collapsible and packable into one of its own pockets (ends up about the size of a book). Although I purchased the Rippac before Tortuga came out with their daypack, I think it shares a lot of similarities – micro-mesh back panel, mesh water bottle pockets, an unpadded laptop / hydration sleeve and two smaller exterior pockets. It also has four loops on the back of the pack, which I threaded an old adjustable neckstrap through to make a makeshift compression system, that also allows me to cinch a wet towel or other item on the outside. The only thing it really lacks is a sternum strap. For the most part, it retains its structure even when not fully loaded, and actually feels incredibly supportive when you have a laptop or something else that is rigid in the laptop sleeve. For my two month trip to Europe and Asia, it easily packed into one of my Tortuga’s zipped water bottle pockets. It even survived being checked on my flight back home (although, despite my better efforts, the wine we packed and padded inside did not). Eddie Bauer does have some good stuff, and occasionally the appearance works, too. Backpacks are one of the areas where that’s especially easy, since most backpacks have a similar aesthetic anyway. Thanks, Alex! I was going to purchase the Tortuga Daypack until I saw your comment. The Eddie Bauer pack seems really great, and at half the price of the Tortuga pack. Do you like the synapse 25 or smaller version better than the packable backpack options (tortuga daypack or TB daylight) options? Or is it a matter of do you want something packable? is the synapse packable? Synapse is not packable. It can be flattened, but it’s more like a regular backpack, rather than a tiny one that’ll stuff into itself or fold up small. I think of the Synapse as a regular/everyday/school/college sort of backpack, whereas the ones on this page are “in case you need it” types of packs, that barely take up any room when you’re not using them, and expand to be fairly functional when you need them. I find packable backpacks quite useful, because you don’t need a backpack every day, and sometimes it’s hard to get a regular backpack on the plane in addition to a big bag. That looks great. It must be new, but I think it looks good. A couple pockets, overall light weight, and pretty simple. Hi, just wondering what do you think of Osprey Ultralight Stuff Pack. Looking for a packable backpack for various travels and day hikes. Like the idea of ChicoBag’s eco friendly approach. Thanks for the advice. That looks like a good choice, and I might have to check it out. Hey, love all your articles…have been turned on to a number of purchases from your site…….at a minimum Outlier should cut you a big check for the number of items I’ve purchased from them after learning about them on your site. Literally probably $4500 worth of purchases in the last year and a half or so as I replace most of my old work and casual clothes. Anyway, one thing I didn’t see on the Tom Bihn….you mention the importance of exterior water bottle access (which I want as well) and I was wondering if the Tom Bihn has that or not. No, not on that one. I think the designs focus on security more than accessibility, so you stick the water bottle in the main compartment so it doesn’t fall out. I’ve gotten used to this, especially with larger, heavier bottles, which make backpacks feel lopsided if they’re in a side pocket, so I don’t mind so much. But with smaller bottles, I like them in the side pocket, so I’d look for one of those if you like those little disposable plastic ones. Don’t leave out convertibles – Travelon has a daypack that converts to a tote and I consider it an essential. It handles in any context – Travelon Stowaway Convertible Tote/ backpack http://amzn.to/1WU0rK0 Use the link or not; it’s a great addition to my travel!